Vishal Bhardwaj is an inveterate storyteller: it could be a children’s story about a wicked witch (Makdee), a re-telling of Macbeth set in Mumbai’s underworld (Maqbool) or his most recent release Pataakha that revolves around two sisters who hate each other. The son of a poet-lyricist, Bhardwaj grew up in Meerut, Uttar Pradesh, watching Hindi films and playing cricket. His artistic life started with playing the harmonium for ghazal singers and it was a chance encounter with legendary director-writer-poet-lyricist Gulzar that gave Bhardwaj his first break in the movies in 1996. Gulzar’s Maachis, set in insurgency-stricken Punjab, not only introduced Bollywood to Bhardwaj’s haunting music but also triggered a partnership between the duo that has given India some of the most exciting films of the last two decades. Thrive Global India: Is your creative process different for writing and composing? 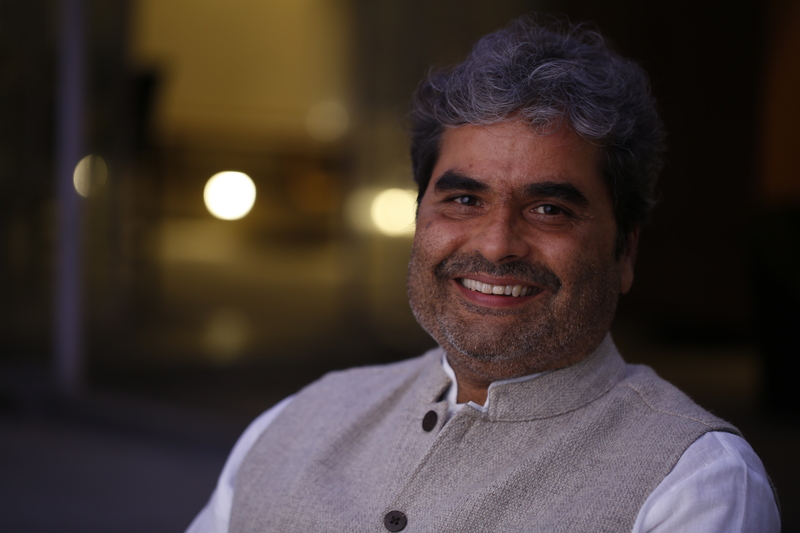 Vishal Bhardwaj: Music is very abstract while writing is tangible so the processes are different. With music, you’re trying to catch notes from the air. You don’t know when it’s going to come. You bring yourself to a state of meditation where what you produce is pure. I like writing in my home in Mussoorie. While writing, you have to follow the three-act structure of plot points. You have to go from the opening to the middle and then resolution. With music, you can start in the middle or even the resolution. TGI: Do you critique your work? VB: I’m never satisfied with what I’ve done—I want to push myself to do more, to be more aesthetically profound in all my work, from music to cinematography. TGI: How do you sustain your creativity? VB: I read, listen to music, and play tennis. I have played sports all my life and it continues to be an integral part of my creative process. I try to play tennis every single day. I have composed some of my best songs and written scenes almost immediately after a game. Physical exercise releases happy, creative pheromones in my head. TGI: Familiar faces or fresh blood, how do you put together a team? VB: With some departments you want fresh blood, while in others you want to go back to the person you were working with. When a team is being put together, obviously talent is very important but personalities also make a difference. I wouldn’t work with someone khadoos (mean and surly)! I like pleasantness in general. And the set is very much part of life—if there’s tension and bad vibes, it makes me want to run away. TGI: What’s the first thing you do when you get out of bed in the mornings? VB: I drink a litre of water. I have a set morning routine that includes playing tennis and meditating. I start work about three or four hours after I wake up. VB: I go to Mussoorie. I unplug by getting away from people. When I’m by myself, I recharge. When I’m with people, I can feel my energy going out. TGI: What’s your relationship with your phone like? VB: I like to switch it off all the time. I don’t like to be communicated with: I like to be the one making the communication. I’d like it to be a one-sided affair. My phone is switched off for hours at length. VB: I read only the good messages about myself. The rest, I refuse to read. It’s the same with film reviews. My friends and assistants only pass the good ones to me. TGI: When was the last time you felt burnt out? VB: With every film, I feel burnt out after completing the shoot. And then again, after it’s released. And then you rejuvenate yourself again—sometimes, a good night’s sleep is enough. It may also take a day or two or weeks. It depends on the kind of trauma you’ve been through while shooting or releasing that film. VB: I would like to stick to my routine, do what I want to do rather than what I’m pushed to do. To do nothing, remain blank, not think about work would be absolutely bliss.